The 1.2V AA 2800 mAh Fujicell NiMH batteries we test here are of the standard NiMH type and are rated pretty high at 2800 mAh (the company also makes LSD NiMH batteries that we are soon also going to test), so we were quite interested to see how these perform, especially considering that they are available at a good price. Now, before moving on to the tests we should clear something important, as some people associate the brand Fujicell with Fujifilm (Fuji), even though both companies have nothing to do with each other. Fujicell is not associated with Fujifilm, although both companies are Japanese and apparently are taking advantage of the popular Japanese Mount Fuji. We have started the test of the 1.2V AA 2800 mAh Fujicell NiMH batteries as we normally do with a low constant current discharge rate of 0.2A and the result we got was 2532 mAh as capacity and while this is a bit shorter from the 2800 mAh rating it is still quite good performance for not a very popular and well known brand of batteries. Increasing the constant current load going all the way up to 2.0A we still manage to get very decent performance, meaning that they can handle well both high and low load applications. 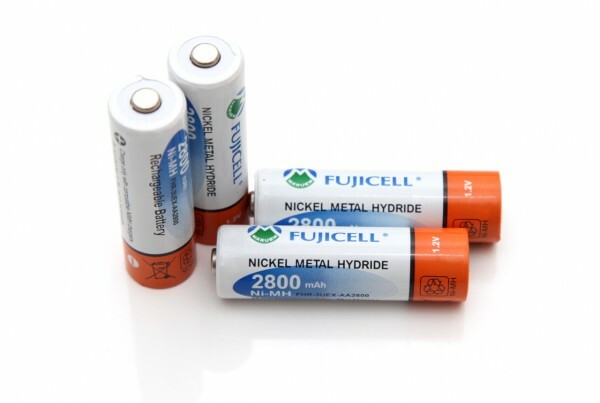 If Fujicell has provided a minimum guaranteed capacity rating of 2500 mAh for these batteries they would’ve met their specs, but now we can say that they fall short of the 2800 mAh rating by quite a bit and even the faster self discharge of higher capacity batteries is not a reason enough for such a difference.